Right up there with the Concord XIs in terms of most anticipated sneaker releases of the 2011 are the Jordan Black Cement IIIs. Even the most casual sneakerheads would love to get their hands on a pair of these, but with so many shoes releasing this fall and winter, few of us can afford every pair that comes out. Luckily, The Fresh Heir has your back. For $5, you can enter to win a pair of Black Cement 3s in your size, saving you a nice $160+ tax. The contest officially begins….NOW. You have until Monday, November 21st to enter. The winner will be drawn at 12 PM on 11/21, and he or she will have their pair delivered within days of the Friday, 11/25 release. 1. Like The Fresh Heir Facebook page: The Fresh Heir – You will find the official contest event page there. 2. Comment on either this post or on the event page’s wall (HERE) with your name and what size shoe you wear. 3. Submit your $5 payment. You are allowed to enter up to THREE times ($15 total). BONUS: Enter 3 times and get a fourth entry free. Also, if three people write on the event page’s wall saying they learned about the contest from you (ex. Tim Larew told me about this), you get ANOTHER free entry. HOW TO PAY: Two very simple options – $5 cash in person if you’re going to be seeing me between now and November 21st… OR … $5 PayPal payment sent to tballer3@comcast.net. (NOTE: Must send PayPal payment as a “gift.” Oherwise, I will only be receiving $4.55 after PayPal fees). 4. On November 21st at 12 PM, I will set up a UStream broadcast and provide all entrants with a password that will allow you to watch live online as I select the winner randomly out of a hat. 5. When the Black Cement IIIs release in limited quantities on Friday, November 25th, I will pick up the winner’s pair in the size they specified. I will then either hand deliver the sneakers to the winner that weekend or I will ship them immediately if the winner is not in my area. 6. IMPORTANT NOTE: One pair of these costs around $170 with tax. I will pay up to $20 out of my own pocket if necessary but no more, so that means that the contest will be cancelled if I do not have 30 entries by November 21st. If there is excess money at the end of the contest, I will be donating it to the American Cancer Society. As always, ask me if you have any questions. Don’t forget to “like” the Facebook page (link up top), and follow me on Twitter @TimLarew for the quickest form of updates. Also, check out this review by one of the best sneaker reviewers out there, JJJumpman23, if you want a better look at the Black Cement IIIs. 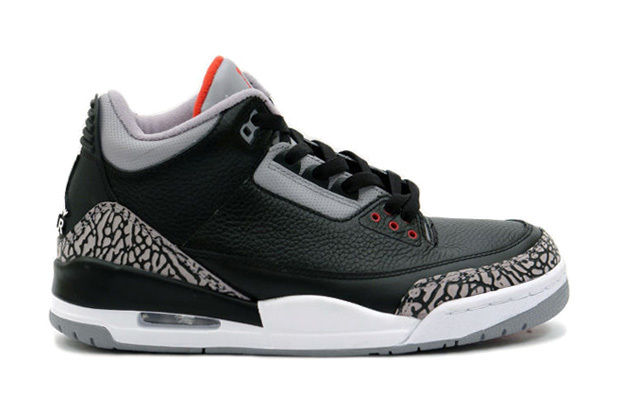 Tags: Black Cement 3, Jordan 3 giveaway, Jordan Black Cement 3 Contest, Jordan Black Cement III, Jordan Black Cement III Contest. Bookmark the permalink. Gohn, do you still want in? Make sure you send me your payment if you want in. Let me know if you need my email address for paypal or personal address for mailed cash or check.